Tn.Coronel Florencio Aulestia Guerrero, his second wife Lucila Matheu Trujillo, his son Victor Florencio Aulestia Mier and daughther Luisa. Los Aulestia de nuestra rama se establecieron en la antigua region de Molleambato, hoy San Miguel de Salcedo. 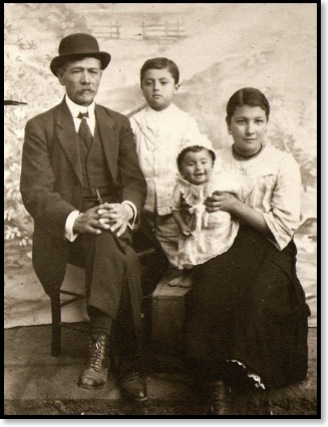 Florencio Aulestia’s ancestors originated in the Basque Country, those that immigrated to the Americas, certainly kept the Basque culture and family traditions alive. They first went to Colombia and then to Ecuador, Peru and Chile. In Ecuador, the Spanish Joaquin Aulestia and his wife Manuela Barriga (1780) settled in the fertile valley of what today is the Cotopaxi Province, especially in the area that eventually became the town of Salcedo. Soon after, they prospered and established strong ties with several families, especially the Guerrero and Matheu families. Ties that grew even stronger through the marriage of their children and grand children. With respect to the closeness of these three families, Dr. Fernando Jurado Novoa wrote in his book entitled “Latacunga – Four Centuries of History,” Volume 13,” as follows. The same, or maybe more than with the Guerrero family, the Aulestias are intertwined with the Matheu family, so much that the history of these two families as told by either one, are very much the same and end on the same origin. That origin being the Guerrero sisters, Carmen and Mercedes Guerrero & Guerrero, daughters of Juan Jose Guerrero and his wife Juana Guerrero Matheu. What is more, their children and grand children grew up together, and to this very day, the families maintain a close relation, cherishing their common ancestry”. Our branch of the Aulestia established themself in the old region of Molleambato. Today San Miguel de Salcedo.